Hi everyone, it’s time for famous yearly Gingerbread House competition at the Grove Park Inn. Below are the details from The Grove Park Inn. Hurry, get your entry in for the competition!! Visit The Grove Park Inn for details. Experience the enchantment of gingerbread. 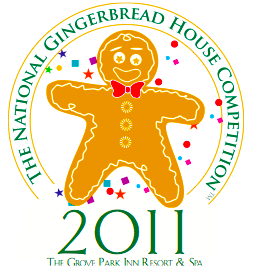 Entries are now being accepted for our 2011 National Gingerbread House Competition! Contestants from across the country will bring their culinary masterpieces to The Grove Park Inn this holiday season. Delight in the imagination shown in these sugar-and-spice creations, strolling through the competition display is a sure way to be swept up in the holiday spirit. Several of this year’s entries will be featured on ABC’s Good Morning America on the morning of Friday, December 23rd!